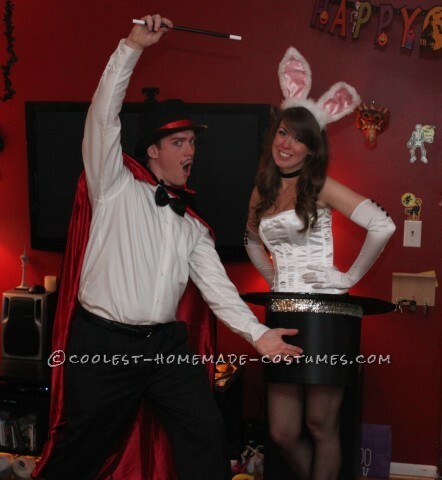 My boyfriend and I decided to be a magician and a rabbit in a top hat this year! We thought it was a unique and cute couple costume, and we wanted it to be something that wasn’t too difficult to create. For the top hat, I just purchased several sheets of poster board, and glued them all together with spray glue. The bottom part of the hat is about 3 poster boards thick, and the brim part of the hat was cut out of an old TV cardboard box. I hot glued the brim to the main part of the hat, and then covered the entire thing in a nice black satin. I added the details of the silver band and sequin trim the brim to add a bit more glamour. I used a lot of hot glue and it held up really well through a night of dancing. The hat was then attached to two pieces of black ribbon that were glued to the inside of the hat, and then the other ends of the ribbon were attached to an elastic belt that I wore tightly around my waist underneath my corset. I wanted the hat to give a floating illusion around my hips, and this seemed like the best option. I didn’t want suspenders or anything like that holding it up. I made the ears from my own pattern and used white fur and a pink satin. I lined them with heavy wire to make sure they stayed perky all night. When making the ears, be sure to have the wire extend out and run along the headband. Cover the ends with ribbon or boa trim. This ensures that the ears don’t get floppy over time. The corset is the Legs Avenue basic white for my top, and for my bottoms, I wore black satin shorts to blend with the hat. Other trimmings included white gloves with black buttons sewn on, and a cotton tail I made simply by sewing cotton balls together. My boyfriend’s cape was one that was purchased, and it was originally a vampire cape, but it still worked! The bow tie, hat and wand were also purchased, and he wore his own clothing underneath. Overall, this was a pretty easy costume to make, and it got a great reaction from a lot of people! It was a good choice because it’s a fun and unusual costume that I hadn’t really seen on anyone yet. My boyfriend even learned card tricks and performed them for our friends, which really added to it. It was a bit of a pain not being able to sit down all night, but the reactions and fun we had with the whole getup was well worth it!! Wow! That is awesome! Great job! I am planning on doing the same costume this year. You did an awesome job! Do you have anymore pics? I am planning on doing the same costume this year….u did an awesome job!!!!! Do you have anymore pics???? i am going to be a same thing but i wanted to make just the brim. can you give more detail as to how you made it? Hi Dina! I just cut out a “doughnut” shape from the cardboard and made sure my hips would fit through it and that I could walk comfortably. The brim is a complete circle around my waist that is about 6″ wide all around when you view it from above. Then I just attached it to the poster board that went around my legs and covered the whole thing with satin. Did you want details of how I attached it to my waist? Let me know if you had other questions!! Hi Melissa! This is great! Was wondering if you could give a little more detail on how (where) exactly you attached the pieces of ribbon inside the hat and onto the belt? Thanks!! hi Laura! The ribbons are attached down the side of the hat at either side of my hip…the ribbons then extend up (but are under) the corset and are attached to an elastic band around my true waist. I just hot glued everything and it all stayed in place! Let me know if you have any other specific questions, and good luck with your costume!